Built in the 1950s, and still one of the leading theme parks in Europe, the popular theme park of Efteling is a must for children of all ages. 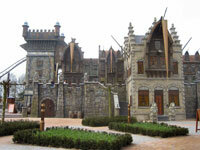 Its fairytale theme captivates children and transports them into their favourite imaginary world. Complete with a fairytale forest, lakes and trails, kids will delight in special attractions like the water show, the maze, the bobsleigh course, miniature three-dimensional worlds to explore, beautiful gardens, a swinging ship ride said to be the largest of its kind in the world, a creepy ghost castle for scares and a whitewater rafting ride. They will also find all the theme park classics including several roller coasters, carousels and playgrounds and the chance to go on boat trips and train rides. There are also plenty of games and activities to enjoy and theatrical performances for entertainment. There are also plenty of restaurants and refreshment stands. Although some of the story-telling attractions are less impressive if you don't understand Dutch, the majority of the park can be enjoyed no matter what language you speak. Queues get very long at Efteling, particularly in peak tourist season (summer) so it is best to arrive early. Opening times: Open daily from at least 10am to 6pm, with extended hours in summer (July through August). Admission: Tickets range from about €37.50 to €67.50, with concessions and plenty of specials available.